The drum set—or drum kit—is one of the most difficult instruments to mic up for a live performance. The principal reason for this difficulty is that a drum set is a multi-faceted piece of equipment, with each piece delivering its own distinctive sound. As such, it is crucial you use the correct microphone for every part of the drum set, and position them in a way that ensures the most desired sound, without conflicting with the other band instruments on stage. In the following article we will outline the several steps required to mic up each part of the drum set for a live performance. Before you begin to mic each individual drum and the cymbals, you will want to place a fairly large dynamic microphone about 1 foot to 18 inches directly over the seat in which the drummer will sit. This is the most important mic in the entire setup. The best mic for the snare drum is a cardioid (heart-shaped) or hypercardioid dynamic microphone. When placing this dynamic mic, you will get the best results if you locate it just marginally above—about one inch—and inside the rim of the drum itself, with the mic pointed at the drum head at an angle of roughly 30-60 degrees. Take care that you place the mic at an angle where it will not be accidentally hit, and perhaps even dislodged, by the drumsticks. Just like the snare drum, you will receive the best sound from the toms when you use a dynamic mic, either heart-shaped or hypercardioid. With larger toms, be sure to select a mic which is fairly sensitive in low frequencies. When placing the microphones for the tom drums, aim for about one to two inches from the skins, again at an angle aimed to avoid accidental contact with the drumsticks. 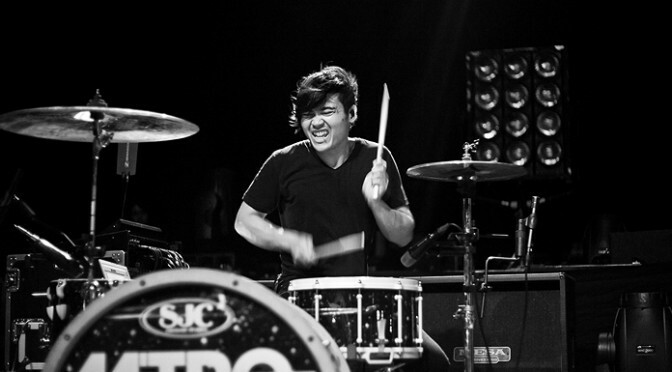 As the Hi-Hat drum can usually be picked up by the overhead mic, it is often unnecessary to mic this drum at all. If you do choose to mic the Hi-Hat, use a small pencil-shaped condenser microphone, placed about 3-4 inches above the drum. The cymbals, like the Hi-Hat drum, are usually present enough to be picked up nicely by the overhead mic. However, if you do choose to mic the cymbals individually, a good choice is a (very) small condenser microphone. These should be placed a good 3-4 inches above each cymbal, and angled out to avoid contact with the drumsticks. As you can see, the process for microphoning a drum set is pretty easy and straightforward. Of course, if you’re just a beginner, it is not absolutely necessary to mic up each individual drum. Instead, start with a good dynamic overhead microphone, as well as two dynamic microphones for the kick and snare drum, respectively. This article was written by our friends over at ZingInstruments.com.